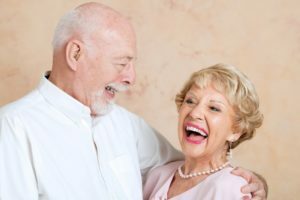 Why Doesn’t My Denture Fit Properly Anymore? Traditional dentures rely on a secure fit and suction to your jaw bone to stay in place. Over time, the pressure that is applied to your jaw bone to keep your denture properly fitting causes your bone to deteriorate. This affects the fit of your denture. Dentures will need to be relined periodically to ensure a good fit, and this is why yearly denture checks with your dentist are recommended. You may think that your denture needs to be replaced if it continues to slip and move when you eat or talk; however, did you know that dental implants can be used to support a denture? Your denture can attach to a few strategically placed implants to provide a more secure and stable fit than traditional dentures. The other benefit of implant-supported dentures is that they help to keep your jaw bone healthy and stimulated, which prevents deterioration and provides better longevity for your denture. Your team at Boyles General Dentistry & Implant Center is the first place you should contact if you have questions or concerns about the fit of your denture. This team specializes in providing comprehensive dental care to patients in Midland, TX, and our dentists will provide a thorough examination that will help to determine if implant supported dentures are the right option for you. Even better, whether you’re looking to get a new denture, or change to an implant supported denture, we can provide all those services in the comfort of our Midland office. We even create and repair dentures right here in our in-office laboratory. This ensures that you have the highest quality product with the best fit possible. Give us a call today to schedule your denture consultation and learn more about how we can help you! Your team at Boyles General Dentistry & Implant Center is comprised of not one or two, but three highly skilled dentists who have nearly 80 years of combined experience. This means that you can rest assured that you are receiving the comprehensive and high quality dental care that we believe every patient deserves. If you would like to contact Boyles General Dentistry & Implant Center, we can be reached through our website or by calling 432-685-7011.